Long have I sought a worthy successor to the likes of H.P. Lovecraft, W.H. Hodgson, and E.A. Poe. Finally, as a BLACK PETALS contributor, I had the lucky chance of reading for illustration—and later, editing—the short stories of author Chris Forbes, who presently resides in my home state of California . What a delight to discover his 2006 Fossil Publications limited edition of uniquely eerie short stories and dark poetry: Strange Gardens of the Mind. Only a leather-bound, parchment-paged, ornately-illustrated copy of his memoirs would have occasioned greater joy. Although these are tales with teeth, they are written with restrained exuberance; readers expecting gore, bloodshed, and crude language can look elsewhere. Subtle horror like Forbes’ releases the imagination to fly high and far enough to convince fans to sleep with their night lights on. 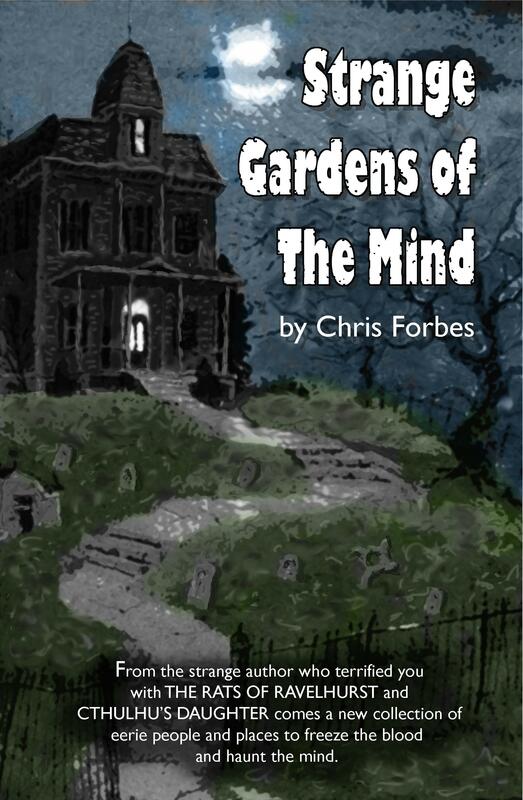 Shifting shadows, the cloud-shrouded moon, the memory-haunted invalid, derelict manses, lonely inns, forbidding woods, fever dreams and madness—of such dark enchantments are Forbes’ poetic tales and their companion poems spun. First and foremost, the elegant language of a bygone era vivifies each piece and adds to their authentic flavor of classic horror. Here is an example from Forbes’ “Legia’s Daughter”: “…her large and darkly expressive eyes seemed to encompass me in their orbits…” (page 53). For the romantically inclined, the occasional stories or poems of star-crossed (and even cross-species) lovers include two of my favorites, “At Your Touch I Tremble” and “From Innusmuth with Love.” Revealing Forbes’ ministerial bent, his few “morality tales,” such as “The People of the Tower,” are executed in a tasteful and honest manner. A small number of pages exhibit copy errors, but not so many as to distract the most meticulous of those among us who love to find the nits (as I confess I do). This is all to the credit of Forbes’ editor/sponsor, Kenneth Crist of Fossil Publications, who can be counted among the author’s most ardent supporters. Aside from the dedication, brief biography and introduction, the body of the book is divided into the following four segments—“Arrivals,” “Departures,” “Visitations,” and “Epitaphs”—alternating poetry with prose. 15 poems and 17 stories are presented in easy-to-read print on 96 pages, the front cover featuring a Victorian house with a graveyard “garden,” and the back cover an enigmatic photo of the stoic-appearing author (who eschews the computer and even the typewriter to write all of his manuscripts by hand). or mail your check and request to Fossil Publications, 11627 Taft Wichita , KS 67209 . And do hurry.